"I've tried to be very clear, in the indirect communications I've had with a number of principles, that in my view there's not going to be public support for subsidizing a new stadium," Minnesota Governor Mark Dayton. The Principles in Governor Dayton's conflict averse quote are Commissioner Don Garber of Major League Soccer and former UnitedHealth CEO Bill McGuire and the New Stadium is the one Garber is requiring McGuire to build before Minnesota's soccer team can join the league. We've seen this sort of thing from MLS before in Miami with David Beckham's group trying to buy into MLS. For whatever economic reason there are some cities MLS wants to have a stadium in before they enter and others that do not require one. You could call it a double standard were it not for a couple other teams - that either have a stadium or great support - that make it a triple, or even quadruple, standard. 1. Television market. If you are near the top of the list, you are in. New York - Yes! you're in! Don't need anything else. Los Angeles - Yes! you're in! Atlanta - Yes! + A NFL owner?! you're in! Miami - No, or at best border line. 2. Investment Fee. Probably should be number one right? No. Well, personally don't think so. If there was no investment (i.e. Franchise Fee) out there for places like LA and Atlanta then MLS would have flipped the bill for the team. In fact, there isn't much concrete evidence out that that even says the group in LA and Atlanta even paid much of one (if at all outside operating fee year to year). 3. Place to play. Top market cities don't need a stadium. If you are not in a top 5 like market, you need your own place. The only city of the four that above that meet this criteria is San Antonio but they don't have the next item. 4. History that shows some rooted soccer support. This is where Miami and Minnesota jump back in and Sacramento and San Antonio drop back out. 5. Pre-existing team (USL, NASL). Finally, the last one that should be the first. A stable team with a front office. Running down this it sort of plays out like: If "1" then you are in. If not "1" then you need the other four items. For Miami, it basically just has number 2, which is likely why it's dropped out of the picture. Sacramento checks off the pre-existing team, strong support boxes but they have no stadium (or much of a plan for one) nor do they have the TV market. It's also not known if they have the financial investment MLS requires. Now we are down to the next two. One of them appears broken and the other is just down right disgusting. Let's start with the broken one first. This past week the Sports Business Journal reported that Gordon Hartman has brought in Citigroup to help sell his NASL San Antonio team. MLS has been meeting with Hartman over the past 12-18 months discussing a future in the league. The news of a sale tells me that either Hartman's group is not in or that Hartman thinks he can't make much in MLS and wants to cash out and move on. What's curious about this is that San Antonio meets the all important stadium requirement along with the pre-existing team item but the sale makes it appear that it is short on all others. Hartman says that Citigroup has already collected the first round of bids for the team, which includes Toyota Field and the adjacent 75-acre soccer complex. In the SBJ report, Hartman said that most of the proceeds from the sale will go to a special needs charity Hartman built. Minnesota is almost there. In fact, it's closest to the Mythical Super City that Don Garber wants. It has they investment fee (likely) and strong support with an existing team but is missing the all important Stadium since they aren't a gigantic TV market. A vote on the still not proposed stadium in Minneapolis comes up this July. Outside of any proposal the (or any) stadium doesn't have the support of Governor Mark Dayton. Dayton is a powerful fella, but he's not the only person in power to think this way. House Speaker Kurt Daudt, Senate Majority Leader Tom Bakk and Minneapolis Mayor Betsy Hodges have also spoken against the prospect of a subsidy for the stadium. "It's great you're coming. It's great you're trying to bring this franchise and excitement and opportunity to Minnesota," Dayton said. "But this time you're going to have to go it alone." That body blow of a quote is likely why the buzz around this latest expansion announcement is already largely forgotten. It's a body blow that Don Garber was willing to take though, and herein lurks the disgusting part of all this. Even if if Minnesota fails on the stadium in the coming years, Garber and MLS got a few words in the press and on social media and all it cost them was a couple plane tickets and a short speech. A few weeks ago AEG, one of the original MLS investment groups, announced that their downtown $30 million a year Farmers Insurance naming rights Los Angeles stadium proposal was... dead. There were a lot of powerful people involved with this. From Tim Leiweke to former Farmers CEO Bob Woudstra. 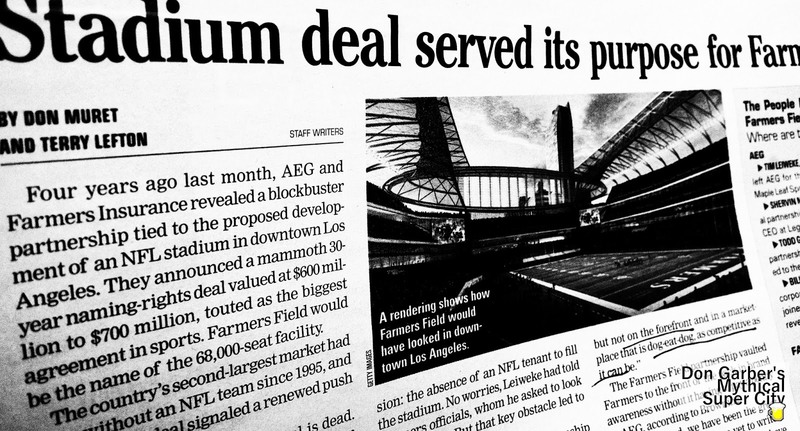 Reports say that between parties and the actual designing of the proposed stadium, AEG dropped $50 million. Fifty! The failure of the project no doubt lead to some corporate reshuffling (among them the departure of Leiweke and Farmers' CMO Kevin Kelso) and you might think that a dead proposal means failure, but alas, you are wrong. A place called Front Row Analytics attached a value of $6 million in total exposure for Farmers Insurance through the whole failed deal. What the executive team at MLS have done is basically a stripped down version of what AEG and Farmers did. Let's call it a 'minor league' version. Garber and team skipped the expensive stadium renderings, research on where to put it and proposals on the impact to the city and citizens and jumped right to the "exposure" benefits and still had the gall to tell McGuire and team that there is no MLS without a stadium. I think the thought is that MLS can bring (drag) cities along by generating some interest with a peppering of press conferences and releases but there is no city in North America that seems to be able to check off all the boxes for MLS. The check boxes exist only because of the way MLS is approaching how to build a professional soccer league.It's a tough row to hoe these days. Political leaders and civilians are on to the scam that is most new stadium proposals. Governor Dayton described citizens in Minneapolis as having as "stadium fatigue." I think that could be said for just about everywhere in the US right now. This approach to growing pro sport's leagues is dying, if not dead already (college facilities, another discussion). Leaders in the industry will be those that think creatively, differently and aren't afraid or too egotistical to look abroad existing solutions to age old problems.